Well first off isn't Liz awesome? She's even funnier in person. My "shipping department" is pretty cool, and she's also a great friend. She saw how stressed out I was and even may have seen some tears when I listed off all the things I had agreed to do. This month is pretty much insane, (for me at least) between flying home for a family wedding, and teaching, and speaking at quilt guilds (hi ladies! can't wait to talk! ), and deadlines for undisclosed places, and then add other deadlines that just pop up because when you first said "yeah, I can do that." you had no idea how insane your month was going to be. Add all other life things...and well Liz took one look at me and said "I have chocolate and diet drink. And do you want me to blog something for you?" I stared at her and said "What would you write about?" She said "Well, we'll see what I can come up with. And we'll give it a shot and then go from there?" kaleidoscope quilt. 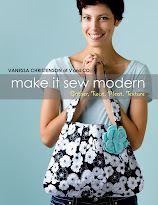 Which btw I'm also teaching this class at my local quilt store today and tomorrow! so far I've made this large block in lime and the pink... and I can't wait to make it in the other color ways as well. I'm super SUPER excited about this fabric coming out! Baby quilt size 40"x40" instructions coming to a magazine near you soon. The pink version is completely done...and well lets just say I love it. This newborn quilt pattern will be in a magazine soon with instructions included. I'll most definitely keep you posted...and I'll ALSO keep you posted on when you can watch me on a quilt show website with a really great and awesome lady. See, I may be stressed but it's all wonderful stress. And wonderful opportunities. I love what I'm doing. I promise to come by and pop in and just do an update of sorts, make sure to write about my funny crazy when I'm not sewing stories as well...so that way I can look back and smile at my timeline of events and well, maybe use this spot as a "journal" of sorts...kind of like I used to. Good friends save the day. I am the last one to ask for help when I should, it's great you have someone to rely on when you need them. Lovely quilt! at first I thought the wreath on the door was your hair! I was like; "Whoa she wasn't lying when she said she has crazy hair days." What a great quilt! It looks awesome in the ombre. You're one block baby quilt is looking great! Loved Liz's post - so funny! Glad she can come in and help you feel not so stressed out. Look forward to seeing your newest stuff! It looks amazing, sure your little noisemaker has already asked to own it! I wish I could help you, but you sound like you've got everything under control now. Good luck with all your projects! I love the new baby quilt! You mention in your blog that you are teaching at your local quilt store (Pine Needles). A short story....last June a friend and I did the Iowa shop hop, or at least part of it - we made it to 40 shops in 6 days and Pine Needles was one of the stores we had the pleasure of visiting. That is where I first heard of you, and saw your fabrics and patterns and of course I left the shop with some of each. I have enjoyed following your blogs and have had several laugh out loud moments. By the way, I live in Washington State and the friend I did the hop with lives in neighboring Idaho. We had more fun on the hop when the people working at the shops would hear where we were from and ask "So are you here visiting family or friends in the area?" and we would smile and say, no, we just flew over for the shop hop. Call us crazy but we had a fun week and saw several great shops, and had quite the haul to fly home with. Good luck with all your deadlines! I just love the Ombre stripe! Love the large block for a baby quilt also! Will you be offering a pattern for it or is it included with the pattern in this post? Hey there sweet friend…how about this pattern for throw pillows? Can you miniaturize (is that a word?) it? 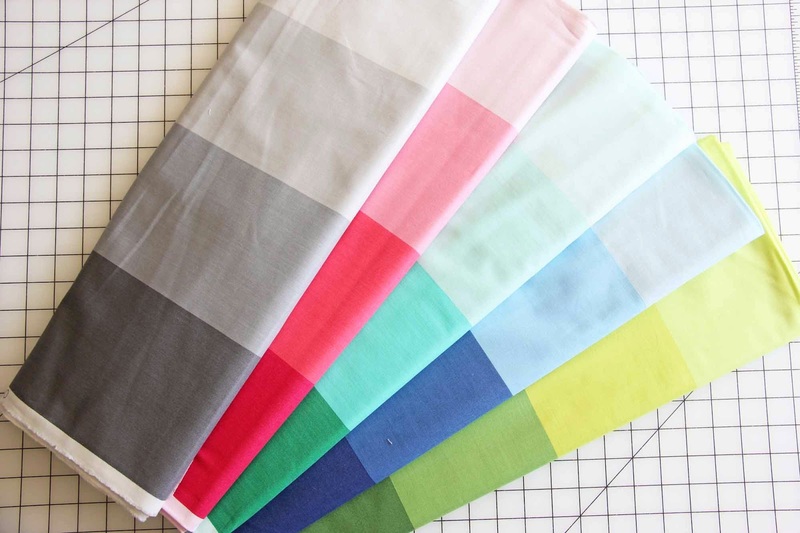 Love your Ombre fabric, and the baby quilt. Would love to get the pattern. 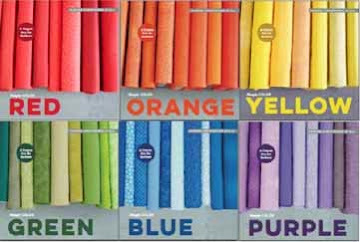 What magazine will your baby quilt be in? I'm just so in love with stars and this one is no exception! Can't wait! So wonderful to have such a good friend.